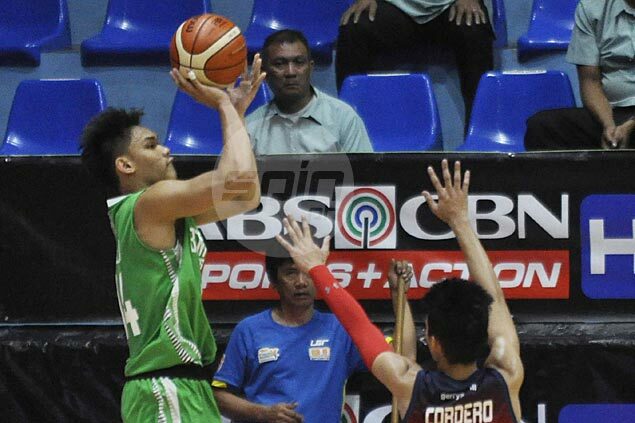 LA SALLE Greenhills slipped past Letran, 71-69, on Thursday to boost its Final Four bid in the NCAA Season 92 juniors basketball tournament at the Filoil Flying V Arena in San Juan. Troy Mallinllin paced the Junior Blazers with 23 points and five rebounds, while Unique Naboa added 18 markers including the go-ahead basket with 52.9 seconds. LSGH remained in fourth place with a 9-3 win-loss slate, two and a half games ahead of Lyceum (6-5). "We dug a deep hole for us in the first half. Kagagawan din namin, so inunti unti," Greenies head coach Marvin Bienvenida. "I'm happy for that I'm happy for the team, sa effort nila,” said Bienvenida. LSGH trailed by 24 points in the first half but bounced back by limiting the Squires to just 18 points in the last two quarters. Jovito Tamayo led the Squires with 15 points, Rhayniel David added 13, while Keifer Cordero had 10 markers. Mapua downed Perpetual Help, 92-82, to pick up its 10th win in 12 outings. Jasper Salenga led the Red Robins with 21 points and four rebounds to keep the Red Robins in third place. Jielo Razon paced the Altalettes with 18 points, Errol Bongay added 18 and Rob Mendoza chipped in with 13. La Salle Greenhills 71 — Mallinllin 23, Naboa 18, Cagulangan 10, Espinosa 4, Lao 4, Cruz 4, Lepalam 4, Marcos 3, Cruz 1.
letran 69 — Tamayo 15, Rhayniel 13, Cordero 10, Reyson 9, Monje 6, Montes 6, Labrador 4, Dolendo 2, Boffa 2, Villanueva 2. Quarterscores: 21-30; 31-51; 56-60; 71-69. Mapua 92 — Salenga 21, Junsay 15, Concepcion 12, Bonifacio 11, Escamis 7, Gozum 6, Lacap 6, Enriquez 5, Samudio 5, Garcia 4. Perpetual 82 — Razon 18, Bongay 18, Mendoza 13, Cuevas 10, Rocero 7, Aquita 6, De Leon 4, Duka 4, Honra 2. Quarterscores: 27-18; 53-40; 78-64; 92-82.